High-current amplifiers are designed for the excitation of very low-impedance loads and are able to deliver high currents. If you intend to work at high voltages with electrical loads of higher impedance, then please consider using a high voltage power amplifier instead. Please click here to get more information about our high voltage power amplifiers. If you hesitate over which kind of power amplifier best suits your needs, please read our application note “High voltage vs high current amplifiers”. 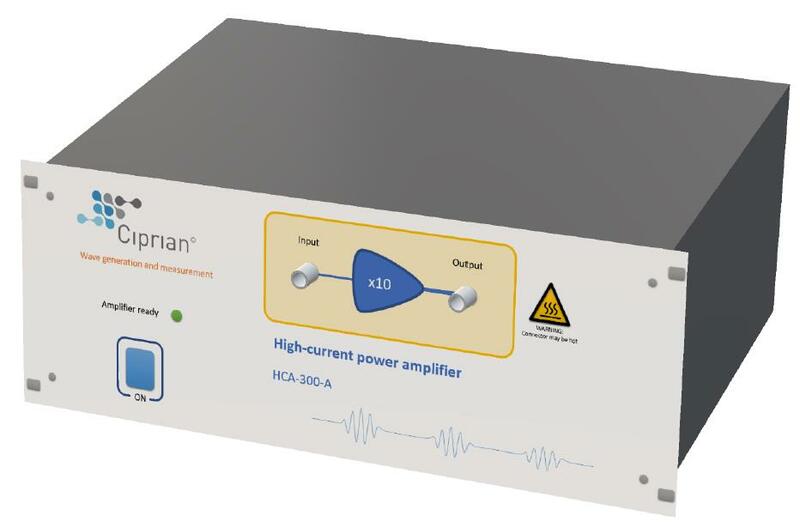 The HCA-300-A is a high-current amplifier capable of continuously delivering 20A at its output. It is designed for the excitation of low-impedance loads and transducers such as EMATs or coils intended for the generation of intense magnetic fields. The output of the amplifier is fully protected against overload events while its internal temperature is continuously monitored, thus providing a safe operation with very high currents at high frequencies. Power amplifiers more in depth. High voltage vs high current amplifiers. Do I need a 50 Ohm input or output? Building an acoustic or ultrasonic experimental setup. Please click here to download datasheet for HCA products.